It has been reported that children as young as fifteen are being recruited by the Iranian regime to participate in armed conflicts. This is a blatant disregard of international law and the UN Security Council has reminded Iran that the UN Charter on children’s rights is applicable. The International Criminal Court sees the recruitment of anyone under eighteen years old for any activities related to armed combat as a war crime. It is scandalous that this is happening with such frequency in Iran, yet it is facing no obstacles. Children have not developed fully enough to participate in war and these children being recruited by the Iranian regime are at extreme risk for major physical and psychological consequences. It takes an extreme toll on the child, the family and society as a whole. International laws are in place to protect children, but they can only be protected if they are enforced. It is major negligence that the international laws are failing to protect these minors. Many of the children being recruited in Iran are from refugee families. They are sent to conflict zones, in particular Syria, where they will fight alongside Syrian dictator Bashar al Assad’s forces and allies. The shocking reason behind such a high number of child recruits is that the Syrian and Iranian regimes are trying to lower the number of reported government casualties and deaths to minimise the loss of morale within the troops. The lives of the children are not valued and the Iranian regime treats them as expendable. The Islamic Revolutionary Guard Corps (IRGC) is instrumental in recruiting minors. The IRGC plays a big role in many of the regime’s crimes and this is just another reason backing the drive by some to take international action to curb its influence. In order to be able to get so many recruits, the authorities promise them legal residency status in Iran. They also promise financial benefits and prey on the people that are living in extreme poverty in certain parts of society in the country. Human Rights Watch has spoken about this alarming practice and its Middle East director, Sarah Leah Whitson, called on Iran to immediately put an end to it. She also called on Iranian authorities to ensure that any refugee children that have been sent away to fight are withdrawn immediately. She said that it is Iran’s responsibility to protect children, not to prey on the vulnerable ones. It is imperative that those responsible are held to account for their crimes. The Iranian authorities have been boasting on television about how they are proud to send child recruits to Syria. Reports are conflicting with some saying that there are children as young as 14 being recruited, but in one television interview a young boy claiming to be only 13 spoke about his experience. Whatever the age, it is very clear that the situation is a war crime and that the young children should be experiencing life at school, not a war abroad. The Vahed Markazi Khabar state-run Television (Central News Unit TV) has released a video showing a 13-year-old Iranian soldier in a gathering of the so-called Defenders of the Shrine. The Shrine Defenders is the name Iran has given to its troop in the Syrian civil war. In this video, the 13-year-old child introduces himself as being from the province of Mazandaran. Another Iranian soldier calls him the youngest Iranian soldier in Syria. 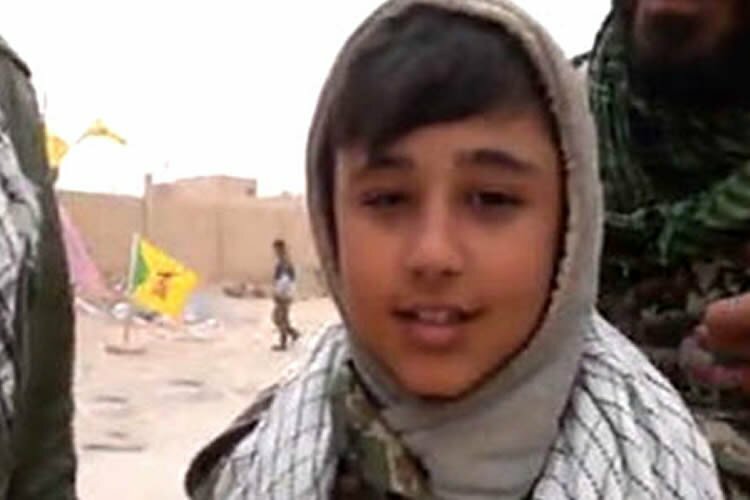 The 13-year-old says that he came to Syria under the influence of Ghassem Soleimani, the commander of the Iran Quds Force, and that he’s aware of the dangers of being killed. This video has been recorded in Abu Kamal. I am Ali … (inaudible). • He’s 13 years old. So where are we now? • Mashallah, the youngest Defender of the Shrine who came from Islamic Iran. And this is now the last moments for the terrorists in the Abu Kamal region. The city is completely clear and our friends have gathered here. Well, it was very strange to us, the 13-year-olds, the martyrs of the understanding are still here. So why are you here? • Well, let us know since this is a danger zone, there was the probability of you dying. Did you think of that? No, martyrdom is an honor and a desire. • Mashallah, Mashallah. Now that the terrorists have run away and the city is free, how do you feel? What do you have to say to the terrorists and the Americans? I am very happy. I say to the Americans that Islam is victorious forever. • Islam is victorious forever! Now is there anything you want to say to your compatriots my dear brother? • What do you want to say to the martyrs of the Shrine? Well done to those who have given their lives for the Shrine. • Mashallah, Mashallah, to those who have given their lives to defend the Ahl al Beit… They were people martyred from your trenches. Do you remember any of them? • Martyr Samadi and martyr Nazari! Like our great brother, we have also lost the likes of Abbas, Qasem, Ali Asghar, and Ali Akbar to defend the people of Allah. Thousands of martyrs so that our national security would not be undermined and now it is the last days of the terrorists and we are in debt to the blood of the martyrs and the Shrine Defenders. In the hope that we come out victorious.